This is just a quick update on the spectacular fireball seen over Western Canada on evening of November 20. According to Alan Hildebrand of the University of Calgary, and an expert on meteors and meteorites, the asteroid that caused the fireball had a mass between 1 and 10 tons and may have been as large as a small desk. Objects of this size usually fragment into many smaller pieces while traveling through the atmosphere. Many of these, much smaller, pieces may have survived to hit the ground. If they did, the meteorites will be spread over many hundreds of square miles (or kilometers). Dr. Hildebrand has determined the most likely area to find the meteorites is around Manitou Lake near the town of Macklin, Saskatchewan, about 100 kilometers south of Lloydminster, near the Alberta boundary. Below is a map of a sighting which were reported to the American Meteor Society (AMS) and are posted on their Fireball Sightings log. A few more sightings were pulled from other sources. I have received a few sighting of this fireball from observers located throughout the United States and Canada. 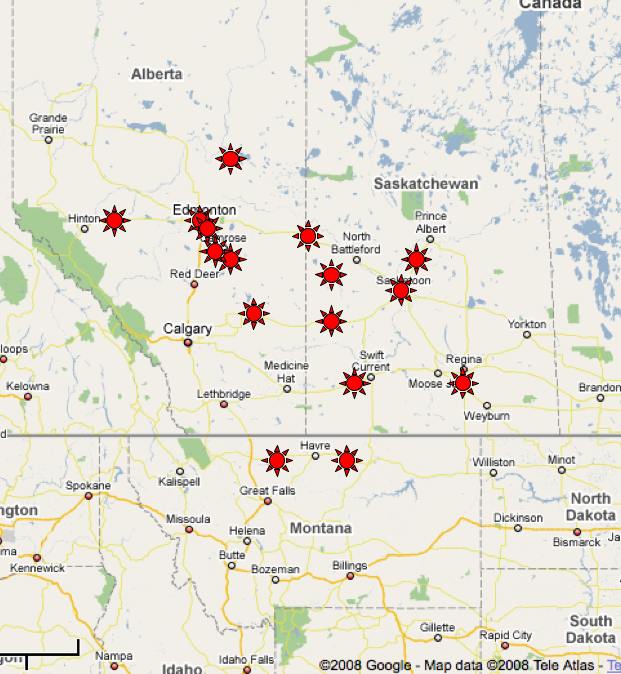 As can be seen from the map above, this particular fireball was only observed from Alberta, Saskatchewan and Montana. During any one night there are many fireballs seen around the world, though most will be fainter than the Canadian one. According to the AMS Fireball Sightings Log, at least 5 additional fireballs as bright or brighter than the Moon were observed. Quite a few of these have been reported in the comments section of this blog. The video and links are carried over from my original posting on the Canadian fireball.